Critical + Automatic female Seeds produce a cannabis plant with Autoflowering genetics and a flowering time of 10-11 weeks from seed. 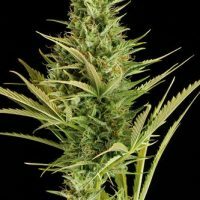 Critical + Automatic female Seeds has a genetic makeup of Dinafem Critical+ x Dinafem Roadrunner and would make an excellent addition to anyones seed collection. Buy Dinafem Critical + Automatic female Seeds at the lowest price online now! 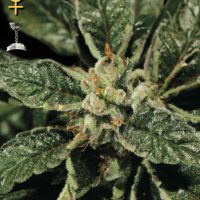 Critical+ Automatic a Dinafem Indica/Sativa/ Ruderalis hybrid, created from the recessive combination of the Dinafem Critical+ with Dinafem Roadrunner genetic lines. Dinafem selected the most similar plants to the original mother and crossed them with strong scent males. As a result of using the best plants, Dinafem have managed to create a brand new autoflowering strain with an excellent aroma and taste, while maintaining a high genetic diversity that ensures an optimum resistance to pests and diseases. This Dinafem variety has a growth pattern characterized by large internodes, which favours a well opened structure, typical of the Dinafem Critical+ regular strain. 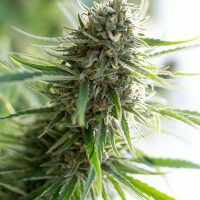 Thanks to this pattern the light penetrates widely throughout all the inner parts of the plant, and buds are well sized through the whole plant. It reaches an average size of 80 to 90 cm when indoors, showing thin lime green coloured leaves, that is similar to that of her original mother. Dinafem Critical+ is well known for its extremely strong taste, massive yield and high quality sweet smoke. When Dinafem Critical+ Automatic enters the flowering stage, she looks like the original Dinafem Critical+: thin leaves, big buds, much white hairs, high calix to leaf ratio. In the final stage of maturation, the pistils are very orange, showing its Skunk heritage. Critical+ Automatic not a perfect copy of the mother, but it is pretty similar. Anyone who knows the Dinafem Critical+ will be able to find the same characteristics in this autoflowering. Dinafem are proud of the outcome and have managed to stabilize the extreme fruity taste, orange sweet shades that has made Critical+ a supersales strain.